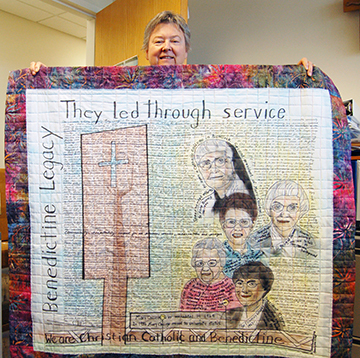 This magnificent "historical diary quilt" was created by Sister Nancy Gunderson. The script tells the story of the tradition and heritage of the Benedictine Sisters, the beginning of the University of Mary (then Mary College), an explanation of the architecture and Benedictine values that guide the mission still today. The quilt "talks about" the sisters who were Presidents and features those whose lives stand out in the growth and development of the college and university. The quilt highlights that Mary College was accdredited in 1969 and moved to university status in 1986. It tells the story weaving in nature and our beautiful view on our hill. Sister Anne Burns spearheaded efforts to open a Catholic college in Bismarck. She was the second president of Mary College, serving from 1956-1974. Sister Brigid Dunne was registrar and director of admissions--always willing to toil in the background. Sister Miriam Schmitt served as business manager from 1966-1981. During her time, four Breuer buildings were built. She spent many sleepless nights praying about how to meet payroll on scarce resources. Sister Thomas Welder began teaching at the university in 1963 and became the fifth president, serving in that capacity for 31 years. She knew every student and faculty member by name! These were (and are - Sister Miriam and Sister Thomas) strong, stellar women with great vision. They showed great servant leadership in their respective areas!